May 12, 2011 Angela G.
I’m a fan of boozy fruit in the summertime. I have fond memories of sitting in the back yard with my fam, drinking homemade sangria from plastic tiki cups full of the freshest fruit available. Sometimes the fruit even came from the bounty my dad would bring back from the farmers at the market, gifts for keeping them entertained with a little blues every Saturday. Sangria reminds me of the “Party in my Tummy” song from Yo Gabba Gabba (yes, I took it there)…can mangos come to the party in the sangria? Can apples come to the party in the sangria? Yes and yes! 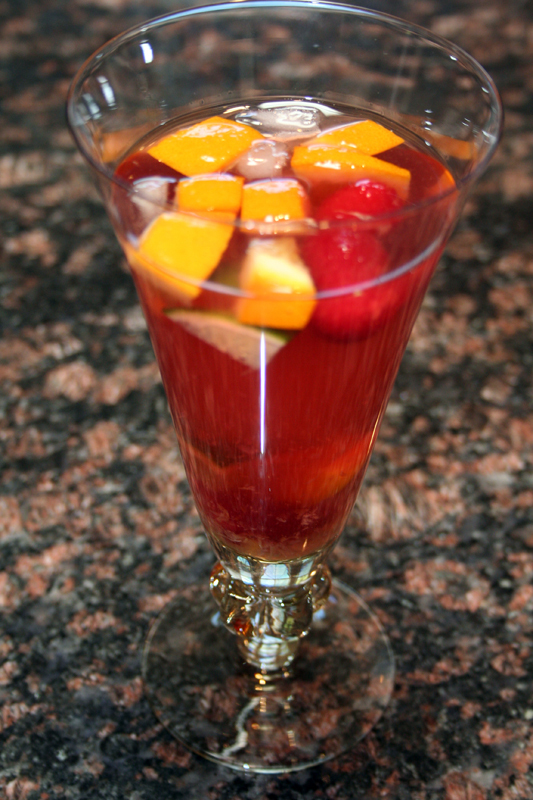 Most every fresh fruit can have a place in the sangria pitcher. I love this version in that it’s a slight departure from the usual red wine concoction. Sangria is incredibly EEO with wine color – red, white, champagne and even port can become lovely versions of this Spanish sipper. For a tropical touch, I combine rose sparkling wine (Spanish cava Cristalino, to keep things authentic) with mango, raspberries, pears and citrus. Brandy becomes a soaking tub for the fruit before it’s blended up with the cava and sprite into bubbly awesomeness. Dandy as candy. Or should I quote Gene Wilder as Willie Wonka with “candy is dandy, but liquor is quicker.” Or maybe no more childhood references in a post about booze. Mix diced pear, mango, orange, lime and raspberries with the brandy in a small bowl. Refrigerate for a half an hour. Fill a gallon pitcher with a few cups of ice. Scoop out the fruit and add to the pitcher. Pour in the cava and top with sprite. Serve immediately.